Amazon Great Indian Sale continues till January 24. From Apple iPhone 6, iPhone SE to Amazon Fire TV Stick, here's a look top offers during Amazon's Great Indian Sale. Amazon Great Indian Sale offer: From Apple iPhone 6, iPhone SE to Amazon Fire TV Stick, here are discounts in the sale. 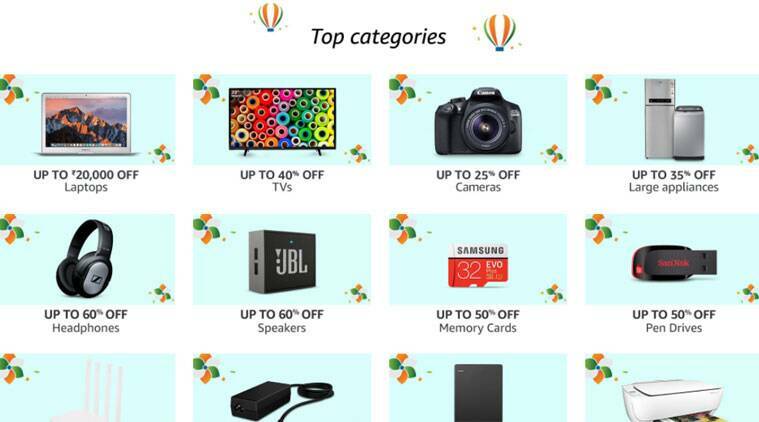 Amazon Great Indian Sale continues till January 24 with e-commerce player offering discounts across products. Amazon’s Great Indian sale started on January 21 with Prime members getting special access on January 20 already. Amazon’s sale is clashing with Flipkart’s Republic Day sale, though as we have seen in the recent past, both players tend to host a sale at the same time. In most sales, mobiles tend to get the maximum attention as older models get serious price cut, though phones like OnePlus 5T, the new Honor View 10, LG V30 + etc do not have any discounts as such. But Amazon’s Great Indian Sale also has some offers on laptops and it is now possible to get enough RAM, a good enough processor and storage for under Rs 60,000. Also Apple’s iPhone SE and iPhone 6 have discounts on the site along with Apple Watch products. Here’s a look at some offers during Amazon’s Great Indian Sale day 2. Amazon’s Fire TV Stick is retailing at Rs 3000 as a deal price. However if you miss the deal, the Fire TV Stick will be sold for Rs 3,499 in the sale, down from Rs 3,999. Do remember, to buy the Amazon Fire TV Stick, it is best to ensure you have an Amazon Prime membership as well, because the streaming device has all the content from Prime Video. Amazon Prime membership in India is currently priced at Rs 999 bundled with free access to Prime Video. The Fire TV Stick also has the Netflix app, Hotstar app and others. Sadly the YouTube app has been pulled from the streaming service. Fire TV Stick also requires a steady and fast WiFi connection at home. Those who still want an Apple iPhone and have a budget of under Rs 30,000 or Rs 20,000 can consider the iPhone 6 or Apple iPhone SE respectively. Apple iPhone 6 is priced at Rs 24,999 during the sale down from the Rs 29,500 price and this one comes with 32GB storage space. Apple iPhone SE is priced at Rs 18,999 during the sale, down from the original price of Rs 26,000. Again this one has only 32GB storage on board. Bonus: Apple iPhone X is listed some discount, though this is just Rs 4500. Apple iPhone X in Silver colour with 64GB storage is listed at Rs 84,500 on Amazon, down from the original price of Rs 89,000. Amazon Great Indian sale has discounts on Apple iPhone SE, iPhone 6 and Apple MacBook Air. Apple Watch also has discounts in Amazon’s sale. The Watch Series 3 in 42mm size with an aluminum case and Black Sport band is priced at Rs 30,900 down from the original price of Rs 31,900. It is not much of a discount compared to the launch price. The Apple Watch 2 though, is retailing for Rs 25,900 down from the original price of Rs 34,900. There’s not much difference between Apple Watch 2 and Watch 3 and both are water-resistant and can be used during swim training as well. 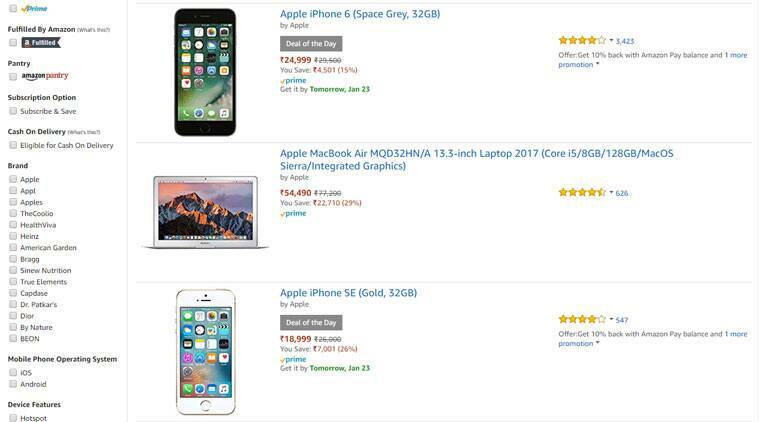 Forget mobiles, laptops have some solid deals on them during Amazon’s Great Indian sale. For starters, there’s the Dell Vostro 14-inch Laptop with the 7th Gen Intel core i5 processor, 8GB RAM, 1TB storage and Windows 10 Home. This is listed at a price of Rs 41,990, which sounds like an interesting deal considering the specifications. The original price is Rs 44,990. Lenovo’s IdeaPad 320E with a 15-inch display and 7th Gen Core Intel i5-7200U processor is listed at a price of Rs 38,990 on the website. This one has only 4GB RAM though, comes with 1TB storage and Windows 10 and MS Office pre-installed. The Lenovo IdeaPad 320-15IKB though has a bigger 15.6-inch display, 7th Gen Core i5-7200U processor coupled with 8GB RAM. It also has 2TB storage, Windows 10 and Intel integrated graphics. The price is Rs 48,490. HP 15-bs145tu is another laptop to consider, though this one comes with no Windows 10 pre-installed. This has a 15.6-inch FHD Laptop, 8th Gen Intel Core i5-8250U processor, 8GB RAM and 1TB storage for a price of Rs 37,990. However, a user will have to install Windows 10 on this. Again when picking a laptop online make sure you are not compromising on RAM or the processor.